This blog entry about the events of Friday, December 31, 2010 was originally posted on January 07, 2011. DAY 16 (NEW YEAR’S DAY): The first day of the year is always a time to let go of the past and make resolutions that, let’s face it, usually go by the wayside by the end of January. It is also a time of renewal and new beginnings, and for some of us on Rapa Nui, there would be an exchanging of vows by day’s end. “Alright, permiso to rock,” Renee requested as we made way to Rano Raraku near the other end of Rapa Nui from Hanga Roa. I had met my “harem” early that morning at Kaimana Inn for our first day of the car rental share that bound us together, although already bonded from New Year’s celebrations (and the social lubricant of alcohol), we hardly needed a contract to keep our group intact. The girls had packed up the SUV with parasols and beers — as well as Pattey’s bag of tricks — and soon we bid farewell to the Rapa Nui family who ran Kaimana, plus the little shy girl next door. “Easter Island, twenty eleven baby… woo!” Leigh-Anne proclaimed as we started the first adventure of the new year. A short drive out of Hanga Roa brought us onto the roads of the island. Not that there were many roads on Easter Island, nor were there many other cars or obstacles — our justification for sipping on Escudos while behind the wheel. We did occasionally encounter groups of wild horses, but mostly we were distracted by the waves dramatically crashing into the rocky shoreline, frothy with white foam that exploded like liquid fireworks in the air. We hugged the coast of the Pacific Ocean, and eventually made it to head-aplenty Rano Raraku, one of the main archaeological sites where the warning signs still made us laugh. “Don’t surf on the moai,” I translated. RANO RARAKU, THE EXTINCT-VOLCANO-TURNED-QUARRY from which most of the moai were carved from, is just one part of the network of archaeological sites in the Rapa Nui National Park, which encompassed pretty much most of uninhabited parts of the island. We paid the $60 USD fee — a dramatic increase since the now-outdated Lonely Planet’s published fee quote of $10 — and made the best with what we had. Fortunately, Pattey brought a lot. “It’s wig time!” she told us, pulling out some afros. I put on a black afro to complement her white one. “We are traveling with the Jackson Five,” Shirley pointed out. Also with her was “Sindy”, the inflatable doll she and Renee had planned to take photos with like a Travelocity gnome. “Sindy with an ‘S,’” Renee pointed out. The sun was blaring down so the parasols came out for those not fortunate enough to be blessed with plenty of melanin, and we took to the walking paths of which we could not stray away from, or else be whistle-blown by the park ranger observing from atop a hill (picture above). For being one of the main sites of Rapa Nui, the quarry wasn’t too crowded at all; there were only three other groups about the size of ours (other than the one of wild horses), most likely other tourists who were not extremely hungover from New Year’s Eve celebrations the night before. However there was still a big headcount, for there were dozens of moai heads scattered around the grounds, left there in varied states of completion: some were still being carved within the bedrock, some detached and partially carved, some completed and standing upright, some fallen over and reclining, and some standing upright but partially buried in soil due to earthquakes and tsunamis. “I’ve had it up to here!” Pattey joked about a couple of the partially submmersed ones. As mysterious and awe-inspiring as it was, it didn’t stop us from striking a pose with them in silly ways: kissing them, picking their noses, giving them a pinch on the cheek, squishing their heads, laying with them, or even tonguing them. Needless to say, group photos spawned jumping photos, plus one photo idea Shirley conjured up where we all posed as various states of moai ourselves. “You are the best moai in the world,” she told us. Horses pointed the way towards the trail to the rim of the crater , where it was revealed what was left inside the extinct volcano: a beautiful lake, also surrounded by moai of varied states. The grandeur was only spoiled by the fact that a lone sad cow had gotten stuck in the mud there, trapped and decomposing, with one eye eaten out. Kati tried to feed it but it was no use. The park rangers said someone was coming to save it, but it seemed like a lie; we just wanted someone to shoot it in the head to put it out of its misery. On the bright side, the trek back down revealed the beautiful view of the island from atop the crater. “That is a wow,” Shirley said in her Swiss-French accent, using “wow” as a noun. “Oh wow,” I said when I saw it. We took a quick pitstop at the food truck in the parking lot for a couple of beers and a big empanada that made what we thought was a “quick pitstop” into a really long one since the woman in the truck made the empanada from scratch, rolling the dough, making the filling and frying it. She had worked in haste though, for it looked like she just shoved in a whole stack of slices of American cheese inside. Nevertheless, it hit the spot. Leigh-Anne and I toasted more beers when we drove down the road to Ahu Tongariki, the iconic site of fifteen moai standing in a row atop an ahu, a platform constructed as a burial site. 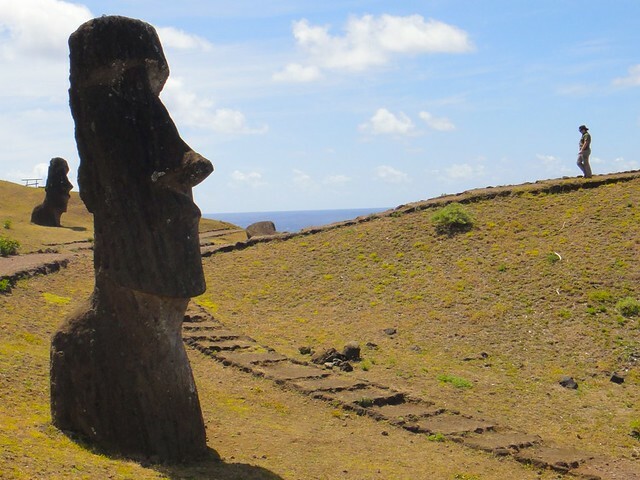 The perfect alignment of moai atop the ahu was intentional; it was re-erected by the Japanese in 1995 after it had been shaken up by a 1960 earthquake, which explains its precision — a precision that has adorned the fronts of many postcards. We wandered the grounds on that hot summer day, shooting the moai from left angles and right angles, making note of the bird on top of the third one, whose poop in the eye sockets made it look like the head was crying (poop). Needless to say, the site provided another opportunity to pose as moai ourselves and for now obligatory jumping photos. Ahu Tongariki was an example of one type of moai. Another type is like the ones that look like they are wearing top hats, or the big furry hats that Hasidic Jewish men wear on Sabbath. There is no confirmed purpose of these “topknots,” other than the speculation that they depicted a male hairstyle on the island ages ago. We saw these hatted moai at another ahu at Anakena, a place that was more vacation than archaeological history lesson, with its subtropical palm trees, and sandy beach. It was there that we went out for a vacation within our vacation, hanging out on the beach, bodysurfing and swimming in the ocean, and posing for the never-tiresome feet in water POV shot. Snacks were available at one of three locally-run food shacks nearby, serving fresh ceviche, empanadas, and of course beer. Back in town (where little girls played with trees), the imbibition continued with the French couple Tom and Sandrine. We didn’t stay long for sunset was approaching — a time that would set the stage for a special moment. We noticed the daylight diminishing so we made haste to get to the perfect spot. “We’re missing the good part [of the sunset! ]” Leigh-Anne said to me. “We’re not missing the best part ‘cause we’re not there yet,” I replied. She high-fived me. NEAR A COASTAL ROAD, not surprisingly near another see-saw, we unloaded the car of a tripod, camera, and other provisions for a special event. The sky was changing all sorts of pinks and oranges, and the clouds gave it a dramatic texture. The ocean crashed into jagged rocks, emitting a calming roar. It was the perfectly romantic setting for what happened next. “Renee and I had been talking about exchanging our vows [on this trip],” Pattey had told me and Leigh-Anne earlier that morning. “[And we talked about it for a while and we figured, let’s just do it! ]” The lesbian couple had been together for nine years and, after much discussion, were ready to make an informal albeit heartfelt commitment to each other — and what better way to do it on the shores of Easter Island on New Year’s Day. The loving couple set up their camcorder on a tripod, expressed their eternal love and friendship to each other, and exchanged vows. “Congratulations!” Leigh-Anne wished them when the rest of us joined in on the celebration. “I’m not breaking anything,” Renee said. Shirley busted out a decent box of wine, and we had an impromptu wedding reception, sitting in a circle on top of rocks near the top of a cave. “I’ve been to a lot of weddings, and this is the best catering,” Pattey complimented Shirley. It was another memorable sunset for me, more than others because of what happened, but I’m sure the memory would be ingrained in the newlyweds’ minds. “[We were wondering about whether or not to do it, if were were going to do a wedding, or a ceremony, or do it on the beach, but we decided to just be spontaneous,]” Pattey told us. “It wasn’t so gay,” Renee quipped. We cheered with our vices as the stars came out, enjoying each other’s company for only our second night together (sans Kati who was back at the inn recovering from too much sun). Leigh-Anne burned some paper of signficance that she needed to clear her life from, and we were careful not to let the embers fly away for fear of burning part of the island down, like the camper whose careless barbecue burned off almost half of the base of Rano Raraku the day before we arrived. For Pattey, not only was she in the company of longtime companionship, but some new friends as well. “It’s really great to share this experience with Renee, but you guys are an added bonus,” she told me earlier that day. “Aww, likewise,” I told her sincerely. “The feeling’s mutual,” Leigh-Anne added. We ended the night back in town at the Miro restobar, which had soon become “our restaurant,” where we ended the night with pizzas and local kana-kanu fish. And with another bottle of wine, we shared one last New Year’s toast before the day marking a new beginning — in more ways than one — came to a happy ending.